Rubber Treading suits commercial applications. One-piece, nosing-tread-riser norament(R) is available with odorless, solvent-free, and fiber-reinforced stair tread adhesive system: nora(R) Stepfix, which allows stair tread to be walked on immediately after installation. Stair tread is available in raised round pastille and hammered surfaces in 25 solid, warm to cool colors, as well as earth tones. 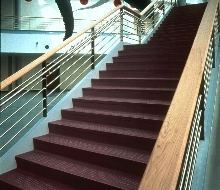 LAWRENCE, MA, 2002 - Freudenberg Building Systems, Inc., manufacturers of nora® Rubber Flooring, announces the introduction of their NEW norament® stairtreads. This new stairtread replaces the norament® 825 C and norament® 925 B stairtreads. "We are able to produce a one-piece nosing-tread-riser stairtread with the same premium quality as our 925 B tread at the price range of the economical 825 C tread with a 10 year limited wear warranty, making norament® stairtreads simply the best value in the market," states Philipp Leferenz, President, Freudenberg Building Systems, Inc. "In addition to the great value of the stairtreads themselves, we also offer an odorless and solvent-free stairtread adhesive system: nora® Stepfix, a fiber-reinforced adhesive, which eliminates downtime, increases productivity, and allows the stairtreads to be walked on immediately after installation." The NEW norament® stairtreads are available in both raised round pastille and hammered surfaces in 25 solid warm to cool colors as well as earth tones to facilitate easy specification throughout the many applications within a commercial project. NEW norament® stairtreads are just part of the comprehensive nora® Rubber Flooring system, which includes matching floor coverings, stairtreads and accessories that allow for design concept consistency throughout the many different areas of building interiors in schools and universities, hospitals, arenas, and all commercial facilities as well as industrial, corporate and high-tech applications for ESD protection. Freudenberg's nora® Rubber Flooring system also includes their Quick Ship program which features seven top selling colors of tiles, treads and cove base, all shipped within 24 hours from receipt of order. Freudenberg Building Systems, Inc. has been located in the United States for over 30 years. It is the US headquarters of the German-based Freudenberg Building Systems/KG, the world's largest manufacturer of commercial rubber floor covering systems. The company has been designing and manufacturing nora® Rubber Flooring for over 50 years, meeting a wide range of functional performance requirements while paying close attention to the aesthetic aspects of interior design. Freudenberg Building Systems, Inc. is a member of the multinational Freudenberg Group. For further information, contact Freudenberg Building Systems, Inc. at 800.332.NORA.